Should You Stay in a Job Working With Difficult People? Sometimes, work can become difficult. Co-workers, bosses, and a negative office environment can all make your job less than enjoyable. In fact, they can make the office a place where you simply don't want to be. 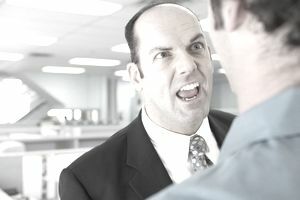 There are options for dealing with difficult people at work. There also may be a way to resolve the situation by getting the other person to move on. Once you have tried every option, you may need to make a decision to leave. What to do next? Don't run right into your boss's office and quit. Don't cause a ruckus and publicly display your anger at the situation. Don't do anything other than to start to put a job search plan in place. You might not have been able to deal with that difficult person to your satisfaction, but, you can control what happens next. Once you have made the decision to leave, the smartest thing to do is to leave on your own terms. Here's how you can make that happen. Get your job search in order. In fact, start now before you even make a final decision to quit. Everyone should have a career network in place, as well as a resume and references ready. It's also wise to take a look at what jobs are available in your niche and geographic location, even if you're not actively job searching. That way, you're prepared when the opportunity or the need arises. If you don't have a career network, start building one - today. If you do have a network in place, make sure your contact list is up-to-date. Touch base with your contacts just to say hello. Plan ahead and get your references in order, before you need them. It will save time scrambling to put together a reference list at the last minute. Once you've made the decision to move on, take the time you spent attempting to deal with that difficult person working on your resume. Make sure you have a polished and professional resume that contains your current employment information. You don't want to be scrambling at the last minute to create a resume. Explore career options and choose a new job or career within or outside your current industry or career field. Start thinking about what you want to do, what you can do, and what you would enjoy doing. You definitely don't want anyone to know you're looking for a new job. So, take steps to keep your job search confidential and start job hunting on the sly. Given the circumstances, the last thing you want to happen is the wrong person finding out that you are looking to make a move. When you start interviewing, the question about why you are leaving your current job will come up. Do not say anything about the "difficult person" issue you have been dealing with because the employer has no way of knowing who was difficult. Anything you say that is negative may reflect on you and might leave the interviewer wondering whether you will be a problem employee. Instead, talk about how you want to advance your skills and your career and how your options are limited at your current job. Or mention that you are looking for a position with more growth or different responsibilities i.e. more technical, less technical, closer to home, you name it. You will also want to carefully interview your future employer to make sure the company, the position, the work environment, and the corporate atmosphere are a good fit. The last thing you want to happen is to go from the frying pan into the fire, so, be very certain that this is a match. Have a list of interview questions ready to ask the interviewer and take the time to make a careful and thorough decision before accepting an offer. Despite the fact that you can't stand the person who has made your life difficult, you hate your boss for not taking your side, and you can't wait to get out the door, don't mention it. You may need a reference from the company in the future and you need to resign as diplomatically and as gracefully as possible. Even if it takes every bit of willpower you have to keep your comments to yourself! There's one more thing you need to be prepared for. Trying to address a difficult situation at work could get you fired. Unfortunately, it doesn't always matter that you're the injured party, you're the one whose life has been made miserable, or that you attempted to do the right thing by speaking up. People don't like complainers and the situation could backfire. If it happens, you will need to have a strategy in place for job searching. Once you are ready to move on, there will be a measure of relief in knowing that the situation is over. The stress will be gone and you can get on with your life. Say farewell to your boss, to your co-workers, to your customers, and to your vendors. Once you have made the decision that the situation isn't able to be remedied, get going. There is no point in wasting any more time. Get going on your job search and move on with your career and your life.